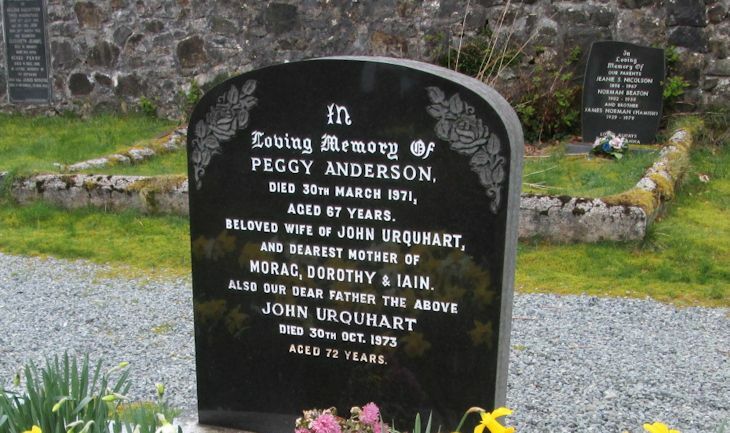 Skye Gravestones | Peggy (Anderson) & John Urquhart. Peggy (Anderson) & John Urquhart. In loving memory of/PEGGY ANDERSON/died 30th March 1971/aged 67 years/beloved wife of JOHN URQUHART/and dearest mother of/MORAG, DOROTHY & IAIN/also our dear father the above/JOHN URQUHART/died 30th Oct. 1973/aged 72 years. Picture Added on 17 April 2014.